Recently, Canada announced that it would end its investor program, closing off another path for Chinese immigrants. However, as Canada closes the door, island countries such as St Kitts and Nevis have opened another window for Chinese entrepreneurs who are seeking immigration for various reasons. Island nations have become the popular alternative immigration choice for rich entrepreneurs in China, because of benefits such as relaxed conditions and low investment requirements. Entrepreneurs such as Zhang Lan, the chairwoman of high-end restaurant chain South Beauty, and Feng Changge, the founder of Harmony Auto, are reported to have migrated there. A newly released report conducted by the Hurun Research Institute said that 64 percent of Chinese millionaires have already migrated with their wealth or are preparing to do so. 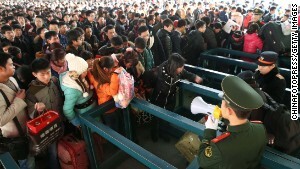 On January 22, 2014, the Center for China and Globalization and the Chinese Academy of Social Sciences jointly released a bluebook on the status of Chinese people migrating overseas. The bluebook showed Canada as the top destination for Chinese migrant investors. An agent surnamed Zhou from St Kitts and Nevis Investment Services said that since the investment immigration service closed in Canada, many clients have set their sights on moving to smaller islands. The service was created by the Greenfield Group Asia Inc., according to its official website, one of the many services in China that offer investment and immigration consultation to the federal two-island country in the West Indies. There are two ways of obtaining nationality there: donating $250,000 per person to local foundations, or by investing at least $400,000 in real estate per family, Zhou said, a relatively low threshold compared to other countries. “This country has no demands on applicants, including the source of investment. Besides, it only takes a short time before you can become a citizen and get a passport,” she said. 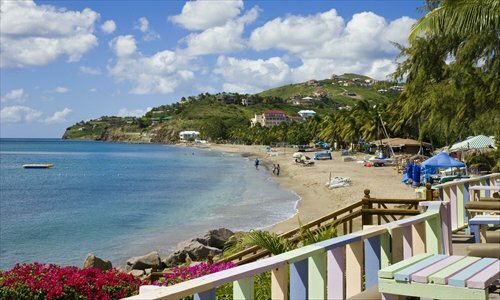 “In the middle of 2012, St Kitts received fewer than 20 Chinese immigrants. That number has now more than doubled, and many clients of listed companies say they were forced to migrate to the island,” a Hong-Kong-based agent surnamed Feng told the Legal Weekly. There are many such clients, Feng said. Those people never live for a long period on the island, and they don’t care about seeing the place. They just need an immigrant’s status. Even though the Chinese clients have acquired the nationality, it doesn’t mean they are true immigrants, and they don’t have election rights, Legal Weekly reports. Zhou said if the clients don’t live on the island, they won’t enjoy the benefits. However, the local benefits aren’t as attractive as the ones offered by Canada or the US, so the people who choose to migrate there usually don’t care for such benefits. She confirmed that Zhang Lan has indeed migrated to St Kitts, but through an agency service based in Taiwan. Canada was formerly a favorite immigration destination. The country’s Immigrant Investor Program (IIP) had been popular in China due to its low risk and high security. The program started in 1986, an immigration policy the Canadian government used to attract investment from abroad. It requires investment of CAD$800,000 ($730,727), which is loaned to the government for five years with no interest, and a personal net worth of CAD$1.6 million. Time Weekly reported that many families’ plans had been disrupted by the change of policy. If it weren’t for the closing of the program, Li Rong might be preparing her winter clothes for her trip to Toronto. A few members of her extended family had already moved to Canada, living in Vancouver and Toronto. The suggestion to migrate to Canada came from her father, a merchant in the raw steel industry who speaks hardly any English. His relatives and friends kept telling him about the benefits of living in Canada. Finally, he decided to invest and give his family a new life. According to Li’s investment plan, Li Rong will be the only person living in Canada, while her parents and brother will only visit Canada occasionally. “The reason they wanted to migrate by investing is so that they can enjoy the benefits Canada offers after retirement, and secondly to transfer their property abroad because in the future China might establish housing or death taxes,” Li told the Time Weekly. Time Weekly reports that in the past 28 years, the IIP has drawn more than 130,000 immigrants into Canada, most of whom are from China. On February 11, the Canadian Finance Minister Jim Flaherty unveiled the 2014 budget, proposing to scrap the program in 2014, a policy that directly affects 65,000 applicants who are waiting for their results, as well as many potential applicants. However, even as Canada closes its door on immigrants, many other countries are trying to win them over. “If the clients who are going with the IIP want to change their channel, we suggest Europe,” Liu Jianyu, a Shanghai-based immigration expert, told Time Weekly. European countries such as the United Kingdom are opening up their immigration policies in order to win over rich Chinese immigrants. In 2013, England gave 30 percent of its million pound investment immigration visas to Chinese. From the end of 2012 to October 2013, the Portuguese government gave out 560 “golden visas” to families who invest over one million euros in Portugal, and 90 percent went to Chinese people, according to Time Weekly. According to data from the CCG’s bluebook, a growing number of rich people in China are migrating overseas mainly due to concerns over the environment, children’s education or to send their private property abroad. 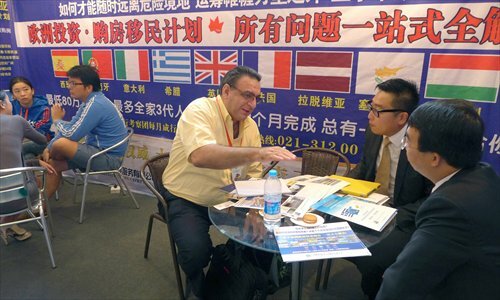 Since the Canadian program was closed, the consultancies contacted by the Global Times said the clients have decided to move to other countries. Liu Guofu, an expert on immigration law from the Beijing Institute of Technology, said that as Canada has closed down its investor program, it’s only natural that the entrepreneurs will choose other countries. There are few choices for entrepreneurs, because only a few have relaxed immigration requirements, Liu said. For example, the US requires at least $500,000 in investment. Some countries require that the applicants speak the local language, while others require that applicants show the source of their investment funds. Island countries usually have lower conditions than countries such as the US or Australia, he said. Furthermore, if entrepreneurs register their companies overseas, they are subject to a lower tax rate, Liu said. 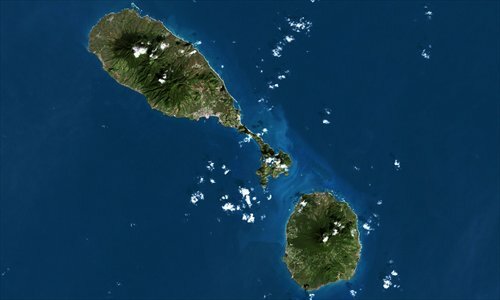 “For those island countries, they don’t have many resources or markets, so they need the investors to develop their economy. Therefore, they give a low tax rate. That always existed,” he said. Another reason for entrepreneurs to choose these countries is so that their companies can become listed, media reported. Many Chinese companies push to get listed as red chips in Hong Kong, but since a regulation came out in 2006 saying all red-chip companies and investors must report to the Ministry of Commerce for approval before setting up companies overseas, no company in the Chinese mainland has received approval, therefore blocking their chance to enter the Hong Kong stock market, the Legal Weekly reported. As a result, island countries have become a popular choice for entrepreneurs: becoming a foreigner means they can get around this regulation. Guo Xinfei, an Internet company director who is in the process of migrating to an island country, told the Legal Weekly that for most countries, migrating means living there for four to 10 years, which is an unfeasible condition for businessmen who are eager to get their companies listed. There are only three countries that don’t have this requirement, and St Kitts is one of them, Guo said. Besides, most countries waive visas for their citizens, which makes it a more convenient location. But there are downsides to this move, Legal Weekly reported. Since China doesn’t accept dual nationality, acquiring a foreign passport means giving up Chinese citizenship as well as opportunities for political titles, such as being a member of the CCPCC or the NPC. Besides, if there are investments within the mineral or energy sector, entrepreneurs will lose their opportunity because they don’t have Chinese citizenship, Guo said. Chinese immigration into Australia now represents the third largest group after migrants from the UK and New Zealand. Hong Kong (CNN) — There’s little doubt which country Australia is targeting under its immigration scheme for the super-wealthy; the investment visa is called sub-class 188 and its permanent visa is called sub-class 888. So far, Australia has granted 65 ‘significant investor’ visas to mainland Chinese. The requirements for getting one of the highly prized visas are simple: all you need is a clean criminal record and $A5 million ($US4.37 million) to invest. There is no language requirement, upper age limit and applicants do not even have to set up a business in Australia. Those able to park their A$5 million investment in Australia — complying investments include government bonds, managed funds and Australian proprietary companies – for more than four years can apply for a permanent visa. 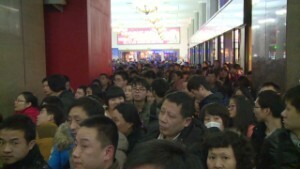 Under the scheme, visa holders can keep their operations running in China if they wish. It’s hoped that the move will attract a greater range of immigrants to Australia. Deloitte partner and global immigration leader Mark Wright told the Australian Broadcasting Corporation the days of Chinese investors coming to Australia simply to start a corner store or a small business were over. “Australia is now looking to attract a larger scale of investment to feed a greater level of infrastructure development,” Wright said. 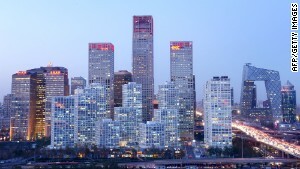 According to a report by professional services company KPMG, the patterns of Chinese investment are beginning to change, with more private Chinese investors expanding their interests in the country. The report said that while Chinese state-owned enterprises (SOEs) accounted for 64% by value of the amount invested in Australian agriculture between 2006-2012, Chinese private investment accounted for 70% of the deal volume. “Chinese companies are playing a more active role compared to other sectors such as mining and gas, where SOEs have dominated,” the report said. According to immigration specialists in Hong Kong, Sydney and Melbourne — where property prices have risen 10% and 6% respectively over the past 12 months — are the preferred destinations for mainland Chinese immigrants. The chief executive officer of McGrath Estate Agents, John McGrath, said that Chinese buyers had boosted prices in certain sectors of the Australian property market. According to the Australian Bureau of Statistics, the proportion of Australian immigrants born in Asia increased from 24% in 2001 to 33% in 2011. 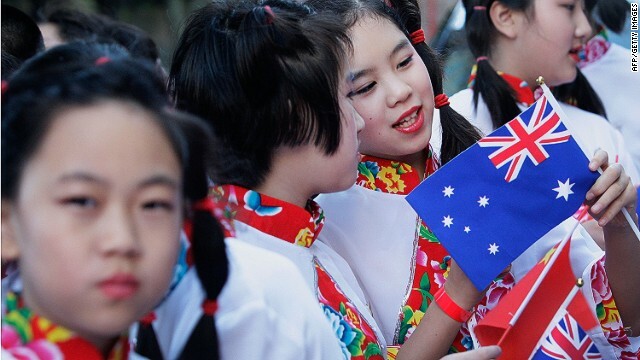 Around 6% of immigrants born overseas came from China — the third largest group in Australia. While this group, along with Indians, represented one of the fastest growing groups, it was still a long way behind immigration from the United Kingdom, at 20%, and New Zealand at 9.1%. Immigration has been a politically charged and emotive subject in Australia, where the conservative Liberal Party won election last year partly on a platform of promising tougher policing of the country’s immigration laws. Australia turns away thousands of refugees and asylum seekers but at the same time is suffering a skills and manpower shortage for manual jobs.